Take the Amtrak directly to West Glacier (10 minutes) or Whitefish, Montana (30 minutes). 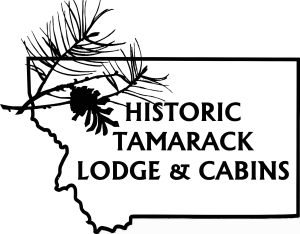 The Historic Tamarack Lodge and Cabins are located next to Glacier National Park within the Flathead National Forest. The closest big city is Kalispell, located only 30 minutes away. Glacier International Airport is located nearby Kalispell, and is only 20 minutes away. The airport code for the Glacier International Airport is “FCA”. From the South: Approximately 8 hours drive from Yellowstone National Park. From Yellowstone, take 287, 191, or 89 north to Interstate-90. Follow interstate 90W to Missoula. In Missoula, get on 93N to Kalispell. In Kalispell, take Highway 2 East all the way through the town of Hungry Horse. We are located on the right side of US Highway 2 at 9549 Highway 2 East, Hungry Horse, Montana. From the West: Traveling from Spokane or Coeur D’Alene, take 90E to St. Regis then take highway 135 east to 200 east to highway 93 north to Kalispell. At the intersection of highway 93 and highway 2, take US highway 2 east towards Glacier National Park all the way through to the town of Hungry Horse. We are located about 2 mile past Hungry on the right at 9549 US highway 2 East, Hungry Horse, Montana.